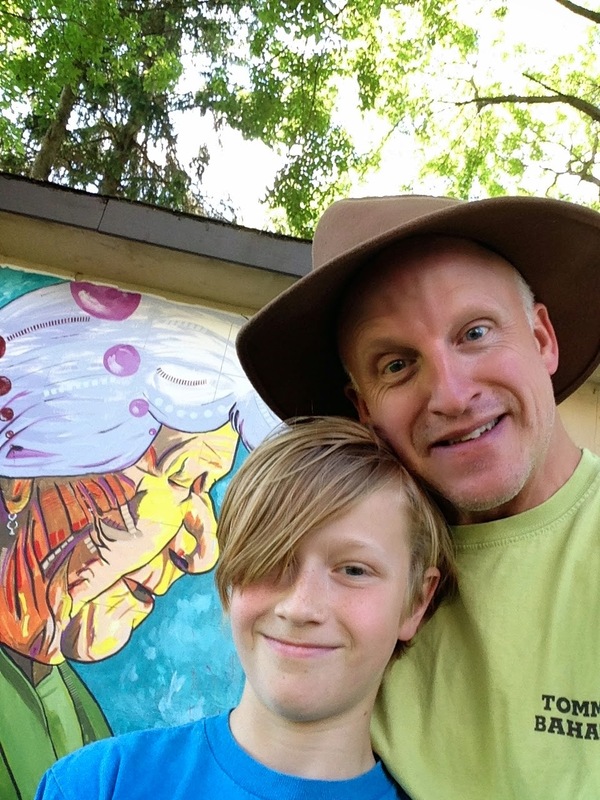 Ben was very earnest about Father's Day, dashing out to the garage on Saturday to secretly work on the best gift ever, something that came out of his mind and on to the canvas. He didn't want to wait until Sunday so he proudly handed it over the evening before. He also shared with me a video that he had been working on about the school year coming to an end. I wish I could post a link to it, but he decided not to publish the action/thriller/comedy about one of his least favourite subjects for fear of upsetting the teacher. I continue to be in awe of his creativity. I find Father's Day to be a very low key, kick back and hang-out-with-the-kids kind of affair. We did just that. Ben and I ambled over to Yoshi's for lunch. I got to have some fresh oysters which pleased me greatly. Over spring rolls and teriyaki chicken we hatched a plan to head to the Athabasca River to find some boards that had washed up on the shore. 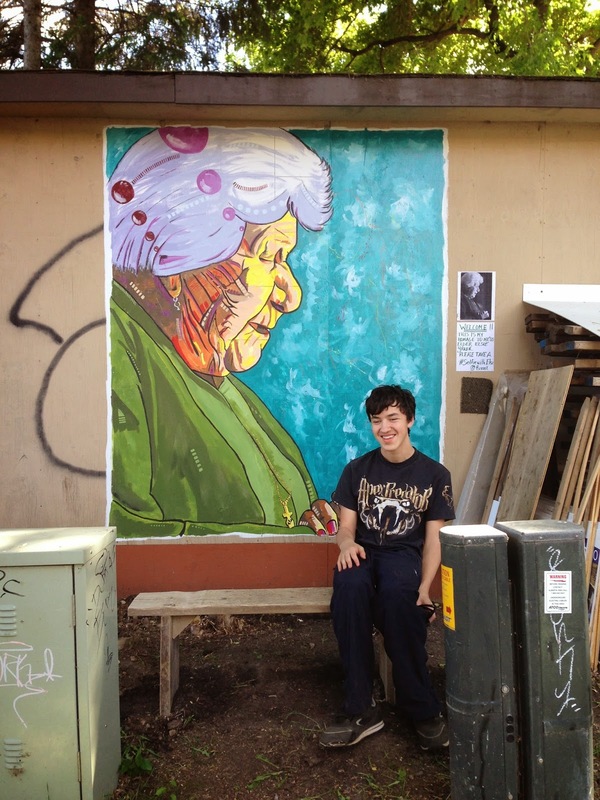 The mural of Elsie Yanik all finished, it begged to have a simple bench so people could sit and reflect. Making the bench out of salvaged weathered wood felt much more appropriate than crafting something new and fancy. Ben went hunting for boards while I took the opportunity to do some Father's Day fishing. On a bright sunny day when the temperature is hot, I like nothing better than sitting in my chair, toes in the Athabasca and fishing rod in hand. It almost doesn't matter if I catch anything or not. That combination feels like heaven to me. As I sat there watching the tip of my rod, and countless nibbles from the plentiful goldeye in this particular bend in the river, I thought to myself how amazingly beautiful Fort McMurray is in the summer. Heather and I have arrived at this same conclusion several times, finding that we truly enjoy the weeks during June, July and August when we get to hang around at home. It may sound trite, but there is no place else on earth I'd rather be on a bright and breezy summer day. We loaded up two perfect pieces of driftwood and headed home. After a 10-minute power nap (I'm exceptionally proficient at falling into an instantaneous deep sleep and waking up fresh as a jaybird) I cobbled together a simple bench, and set it in place. It was a pleasant surprise that Dylan came home, as I had expected him to be gone for a couple of days with his Mom. We enjoyed a Father-Son-Son supper, then Dylan and Ben descended into the basement to play some video games together. Hearing them laugh and play together was a Father's Day present all in itself. The fact that they have grown up to love and enjoy each other is such a blessing. It was a fabulous Father's Day, an idyllic Sunday in Fort McMurray.